The earrings are absolutely stunning. 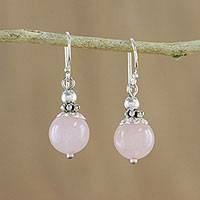 The rose quartz is of a good quality and the sterling silver details are exquisite. 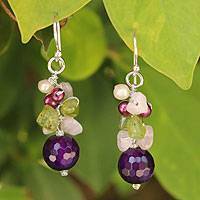 These earrings are very versatile - they look great with casual wear as well as with dressier outfits. 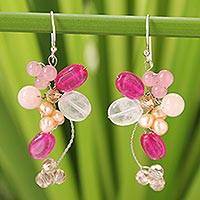 34 Carat Rose Quartz and Silver Dangle Earrings, "Blushing Romance"
Handmade Beaded Rose Quartz Earrings, "Afternoon Pink"
Worn by both women and men, earrings have usually been considered women's jewelry in the past in Western cultures. Ear piercing is one of the oldest known forms of modifying the body, and warriors wearing earrings are seen carved in walls in Persepolis in ancient Persia. Today, earrings are widely used. 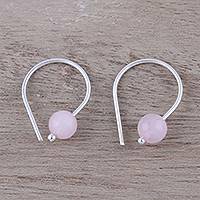 Whether set on posts or wires, rose quartz earrings are a feminine favorite. Chandelier earrings, seductive drop earrings and exquisite filigree earrings are excellent showcases for the lovely stone. The clear pink gem is one of the most desirable varieties of quartz. Its milky aspect is attributed to the presence of tiny rutile needles within the stone. 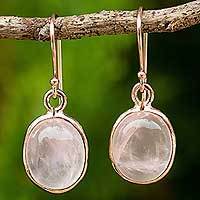 Rose quartz has been carved since early times and is often faceted when set in jewelry. 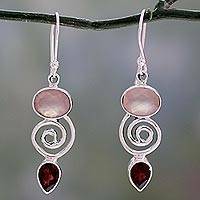 Novica's Rose Quartz Earrings Collection features stunning earrings with matching rose quartz jewelry to complement them. Meticulously handcrafted by expert artisans and jewelry designers, they come from around the world. 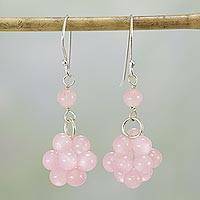 For the most part, our collection includes sterling silver earrings adorned with striking arrangements of rose quartz.